A stash of pistachios, and a windfall of walnuts from faraway Tehran had me rubbing my hands in glee as I got ready to bake a birthday cake for my husband’s birthday. I had a rich, smooth, somewhat adult, cappuccino cheesecake in mind but I also wanted to use the newly-arrived nuts in the cake. 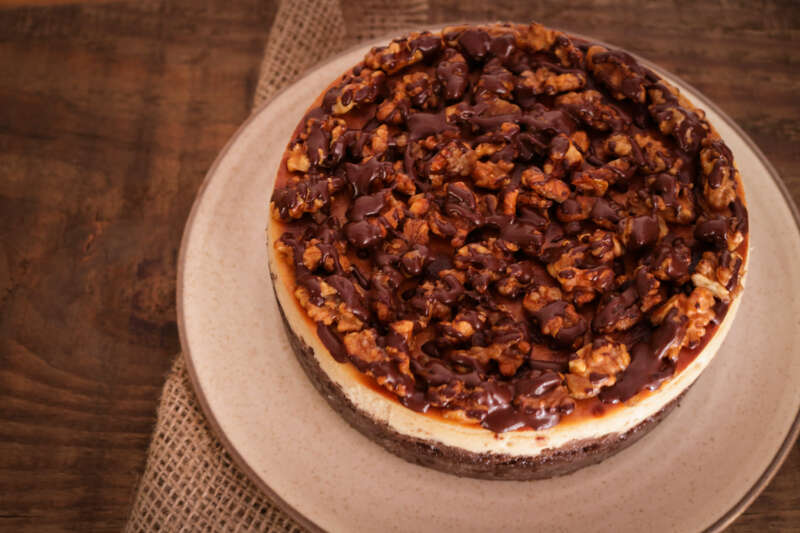 A salted walnut praline seemed like the perfect crunchy crown for the creamy, java-infused cheesecake. Wrinkly, with 2 distinct lobes, walnuts have an uncanny resemblance to the brain. Can’t help thinking that they are nature’s way of dropping a hint, telling us, “Eat your walnuts. With monounsaturated fats making up 70 per cent of their nutrients, they are good for your brain”. I read somewhere that just 25 grams of walnuts can provide 90 per cent of our daily recommended dose of Omega-3 fatty acids. I like their slightly astringent, faintly bitter nuttiness, which equally complements both sweet and savoury foods. When you eat a brownie I bet you (like me) wait for the moment when your teeth encounter the light resistance from the walnuts and the pleasure of biting into them. Brownies without walnuts are simply not as exciting. I also love them in salads, on pizzas and even in pasta. Together, coffee and walnuts are like a mature, well-heeled couple. They resonate depth of colour and flavour and bring to mind leather-bound volumes, fireplaces, Winchester sofas and deep discussions over brandy snifters. Word association aside, my intention was to make a birthday cake for a grown-up, bittersweet, layered and a little complex, like life itself. Baked cheesecakes are custardy in texture and the walnut praline on top would provide a proper, legitimate crunch to the tender cake. My way of making a birthday cake or celebration cake special is by incorporating elements like a sauce or a filling or streusal or even special liqueurs to the cake rather than plasticky sugar loaded icing. Salt, in dessert is a fantastic element of modern desserts. For someone like me, who doesn’t like really sweet desserts, this is a great way of cutting the sugar on the palate. In the battle between caramel versus salted caramel, I throw my weight behind the challenger. Old fashioned caramel seems so plain and even a little boring for a birthday cake. So of course, the walnut praline had to have a salty edge. A few flakes of sodium chloride in the caramel made the walnuts pop with distinct bitter, sweet and salty impressions on the tongue. I couldn’t resist sneaking some even before they could cool and stowed the leftovers away for snacking later. The praline can be made ahead and keeps well for a few days in airtight container. Moving on to the cheesecake itself, which is a fairly straightforward baked cheesecake with cream cheese / hung curd, eggs, sugar, cream and instant coffee. Cream cheese will yield a firmer (although still creamy) cake while hung and drained yoghurt might result in a softer cake that would need gentler handling. If you decide to use hung yoghurt, I suggest you go with half cream cheese and half hung yoghurt. As with all cheesecakes, patience is the key – first while baking on low heat, then with cooling and finally with leaving it to set in the fridge. But the wait will be more than compensated by the cake, I promise. In a mood to indulge the music fanatic I married, I bought him a turntable for his growing vinyl collection, knowing that Sunday mornings would now be spent with the records he loves so much. And since I was being generous, his birthday cake too had to be over the top with a chocolate cookie crust and a glossy drizzle of chocolate ganache on top. 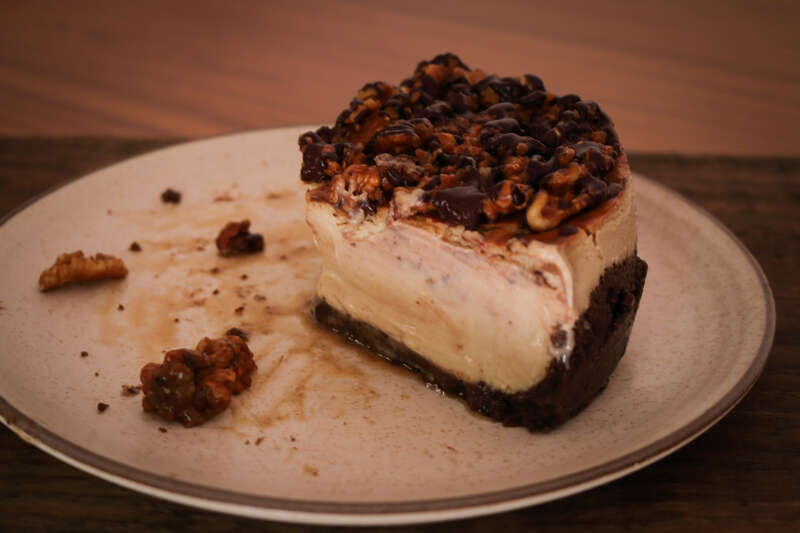 Chocolate is always welcome, although if you decide to do without it, the cake would still be delicious with a strong resonance of coffee, the tang of cream cheese and the naughty salt-sweet crunch of the walnut praline. When you’re in the mood to spoil someone, swirl your time, energy, and love into this silky, voluptuous cheesecake and every mouthful will taste like a delicious endearment. Hi, The cream for ganache is thick/double cream or single/cooking cream? Since the ganache is for drizzling, light cream works just fine. This looks amazing! I made ALOT of cheesecake at my coffee shop and this most definitely would have been a HUGE hit! I also really like salt in my desserts. I think it brings out all the other flavors. Thank you! This cake is addictive! Walnuts and coffee are a match made in heaven and yes, a little salt just brightens all the flavours. Never noticed that walnuts bore a resemblance to the brain, but you’re right — they do! They’re great in baked goods. And what a baked good you’ve made us! 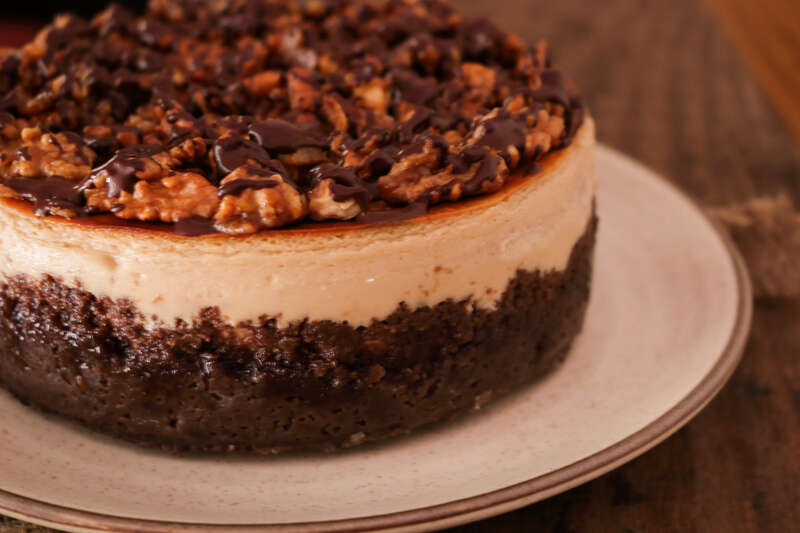 Love cheesecake, and this looks terrific. Thanks! 😀 very kind words John. Thank you! This cake looks amazing!!! I’d like to try it for about 15-20 people. Will doubling the proportions work? To be honest, I don’t know since I’ve never tried doubling it. No reason it shouldn’t work. If you decide to double it, I suggest you use a wider springform pan so that you end up with a very tall and unsteady cake. Good luck! salted walnut praline sounds like the sort of thing that needs to be on everything (: my parents are major walnut (well nut in general) addicts, so i grew up with walnut brownies (and now they don’t taste right without them! ).